Keep your vehicle’s windshield clear, plus find the room for some extra storage with our spacious Barn. This elaborate setup offers a 12-foot clearance in the inside of the middle, with two 8-foot high rooms on either side, ideal for storage. Buy it for the storage and shelter, enjoy it for the aesthetic, traditional look. Truss is required on all units 26′ or wider in the middle section. Price of truss is included in base price shown. 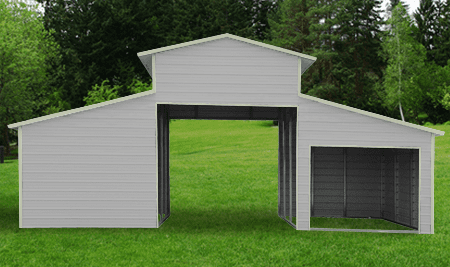 Vertical roof is required on all barns 40′ or longer. Base pricing reflects this requirement.